I am so honored to be a part of our growing cloth diapering community in which we all share one mission – to spread the word that modern cloth diapering can be hip, fun, and easy. Modern cloth diapering is no longer limited to pre-folds, rubber pants, and pins. But how do you share this information with your friends, family and loved ones? For me I share it online here on my blog. I share it with friends who are pregnant or have children in diapers. It’s a shame that there isn’t a guide book that I can hand out and share with those friends because I can’t teach them everything that I know in one conversation. 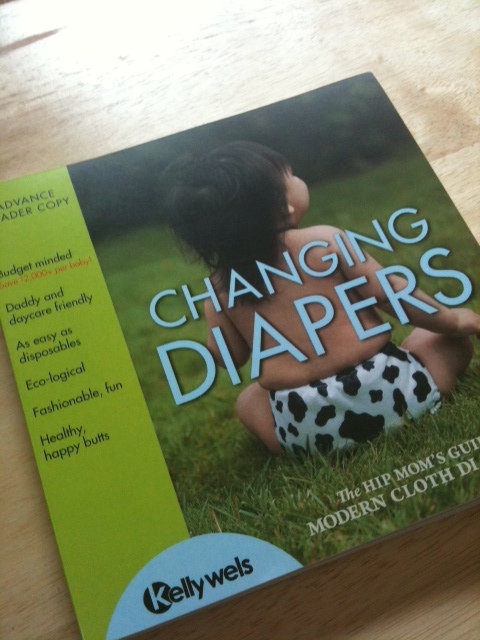 Oh wait, there is a guide book to cloth diapers! My good friend, Kelly Wels, has been working on this guide book for several years now and I almost cried when I received my advanced copy a few months ago. Changing Diapers – The Hip Mom’s Guide to Modern Cloth Diapering is the essential guide to cloth diapering today. I wish I had this little treasure 3 years ago when I started my search to understand cloth diapering (actually I wish it was available 8 yrs ago when I had my son). I read every single page and bookmarked some of my favorite sections to reference later. Kelly has been in the cloth diapering industry for over 10 years now and has seen just about everything one can imagine when it comes to cloth diapers. As the owner and founder of DiaperShops.com and KellysCloset.com, Kelly is considered one of the top most experts in the market. She has poured blood, sweat and tears into her business and now into her book. Late last fall Kelly stepped away from her retail store (staying on as a consultant to the new owners) to spend more time with her family and to focus on the Changing Diapers project. I am happy to now be a part of the DiaperShops/Kelly’s Closet family as I assist in their social media and marketing efforts. Kelly has taught me so much but most importantly she has taught me to believe in myself and follow my dreams. Who was this book written for? Who should own a copy of this book? Any family who is considering using cloth diapers. Any pregnant woman who may not fully understand all of their choices in diapering today. Any (or shall I say ALL) nurses, doctors, midwives, hospitals, OBGYNs, doulas and health care professionals who work with pregnant women and babies. Day care centers, nannies and child caregivers. Anyone who helps the needy and/or low income families when times are rough. Father’s who may be skeptical about using cloth diapers. Changing Diapers – A Hip Mom’s Guide to Modern Cloth Diapering is sized just right to make a perfect baby shower gift. I plan on giving it to any friends who are pregnant in the future (along with a cloth diaper or two) so that they can make their own decision on whether cloth diapering is right for them. Chapter 1: Why Choose Cloth Diapers? 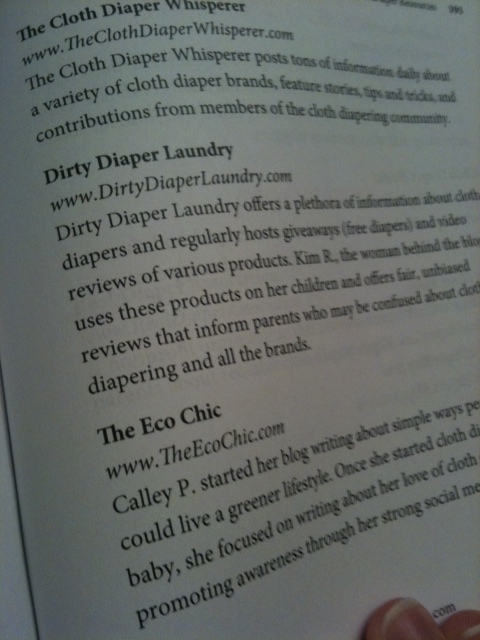 Don’t just take my word on how awesome this book is, Kelly has some amazing endorsements from some of the leaders in the cloth diapering industry. Here is one of my favorite quotes from Jennifer Labit, owner of Cotton Babies. GIVEAWAY! 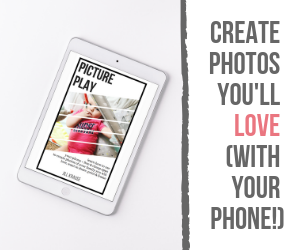 Would you like to win a special Hip Mom prize package? Kelly will be giving one of my lucky readers 1 Rump-a-rooz one-sized cloth diaper (my absolute favorite brand) along with a Hip Mom temporary tattoo. Giveaway will close on Sept. 6th, 2011. Disclosure: I received a copy of Changing Diapers for this review. Kelly Wels and I are friends and have worked on several cloth diapering projects together. I was not paid to write this review and the opinions expressed in this post are my own. Affiliate links are included in this post. I would love to win this book! It’s just not in my budget right now! I decided to cloth diaper because I have always loved the idea, then I had a son with super-sensitive skin. I love cloth diapering and would love a copy of this book! I actually decided i wanted to cloth diaper when I was, maybe, 7 years old. I even use to steal my mom’s dish towels to use on my dolls. But I wanted to do it because my mom said she cloth diapered my brother and me for a month or two then gave up. Since then i had a mission to show my mom that cloth diapers weren’t hard at all. And now with a little one who is almost a year old she has never been more proud of me. I actually use to be scared of the idea of cloth diapering. With my first (who is 15mths old now) I used disposables and I hate almost everything about them. the cost, sticky trash, leaks, rashes, etc. I am now 11wks pregnant with baby number two and got interested in an alternative method. I started talking to my friends that CD and they have definitely convinced me! I think I’m still scared about keeping up with washing, but other then that I am very excited. I wanted to cloth diaper to keep chemicals off my baby. Since diapers are on baby 24/7, I wanted to eliminate unnecessary chemicals from sitting on his skin. I decided to cloth diaper before my son was born. I had read about cloth diapers and thought it sounded like a great idea. I chose to cloth diaper for cost and cuteness! Now that my son is here and has really sensitive skin, my choice just continues to make the most sense for us! I plan to cloth diaper my first son due in December. I like how it can help prevent rashes. I am going to cloth diaper our next child to save money, be more “green” and because they are so cute! We’re cloth diapering to save money! And the more I hear people talk about it, the more excited I am – it sounds easy, less stinky, and so much easier on the baby’s bum! Melanie J recently posted..Masquerade 50th Birthday Cake! We decided to cloth diaper mostly to save money (I’m a SAHM and my husband is going to school full time…) and put something good on our baby’s bottom! <3 cloth diapers and would LOVE to try the rumparooz! I started cding to save money and to stop filling landfills with disposables. we started cloth diapering because of my son’s skin sensitivities- once we made the switch we never went back. the whole experience made me really question what was in sposies, after some research, i knew cloth was the only way! We decided to cloth diaper our daughter because of the cost savings and because they’re so darn cute! I decided to cloth diaper to save money and because fluffy butts are just SO cute! I decided to cloth diaper to save money and because they are just so cute and I figured that diapers were going to be my life for the next few years so I might as well enjoy it! I mainly chose to cloth diaper to try and keep our waste/landfill contribution down. Especially when I learned how LONG it takes for a single disposable to break down. Trying to keep our footprints as small/light as possible! We cloth diaper because we love the idea of using the same diapers on multiple kids! I first wanted to cloth diaper because I knew disposables would be expensive, so I wanted to try to save money. But after trying disposables on a couple occasions, I found that my son would have bad reactions to all the chemicals, so cloth was the only healthy option for him. I decided to cloth diaper because I hated all the diaper trash we were throwing away and I wanted to use something that didn’t have the nasty chemicals in it. I was intimidated by them so I was late to start but am so happy we did. I wanted to cloth diaper because it made sense to me. Less waste, lower cost, no rashes.. hubby’s big sell was the cost effective side of it. The biggest thing for me was the rashes. With toddler, when she was still in diapers, she’d break out in a rash after peeing in a sposie *once*. That’s all it took. Baby girl is the same. We used sposies for the first 2 weeks and she had a red bum for the entire time. 6 hours into cloth and it was gone. She hasn’t had a rash since and she’s 3 months old now. We decided to cloth diaper our 4 month old son(now 15 months) after all of the leaks and rashes he got from disposables, should of made the switch a long time ago, we were just too intimadated by cloth! i started cding for the environment; 4 years later still at it because i love it! they work better than disposables anyways!! I cloth diaper because they are just so cute. We decided to cloth diaper to save money in the beginning. After learning about all the chemicals in disposables I have now become a die hard cloth diaperer. We are expecting #3 and you can bet that he will be in cloth 24/7! i cloth diaper because i think it would be more comfortable than wearing disposables!!! (eco-friendly and saving money are just two bonuses!!). My husband and I were both cloth diapered and are going to with our children bc who wants chemicals on their little ones bottoms. I want to cloth diaper (when my first lo arrives) because I know it will make an environmental impact. Disposable diapers create so much waste. I will be happy knowing that I will not be contributing to that. Plus, they don’t have the same harsh chemicals as disposables and cloth diapers are super cute! I am really thankful that there is a guide that teaches moms how to lessen irritation to their babies’ skin. Cloth diaper is affordable and comfortable. A product that is worth the recommendation. I don’t know why I first looked into it…but now I think I liked not throwing all those disposables away, not spending as much money, and they are super cute!! Plus, they don’t smell funny! I love cloth diapering because I am minimizing the toxins she is exposed to and reducing waste for the environment. Oh and they are so cute! This should be required reading for all new parents & caregivers to show them how easy cloth diapering really is. Anyone can do it and there are great resources out there like this to help!